Why do 5:1 or even 10:1 Turndown mod cons need a huge buffer tank? A great thread awhile back had one pro-poster write that the even a 10:1 boiler had a hard time running a single 60ft zone of baseboard at 48F outdoor temp, and a 5:1 boiler trouble with outside temps over 35F. That 20k minimum firing rates are inadequate. Is call for heat too quickly satisfied due to low mass boiler, so it short cycles over and over, burner on and off circs run but no heat gets delivered? whereas it would get delivered if lowest firing rate was 8k or lower OR with a buffer tank burner wouldn't have to fire over and over, zones would just 'sip' from the buffer tank? Would another solution be to use a reverse indirect as a buffer tank and therefore have one tank instead of two? We are in the midst of deciding on a boiler and getting a great education from all the pros here on HH from the rich library of threads here. I think it really comes down to your wants and expectations. One way is to look at the smallest load, and how often you are at design conditions that the smallest load even is at full output condition. So run some cals under various conditions, see how much capacity provides the best outcome. Use one of the simulation programs for quick assessment as you change tank size and temperatures. Some suggest at least a 10 minute run on the boiler under any condition. Keep in mind it wasn't all that long ago that we only had single speed boilers, depending on mass and water content for buffering,a cast boiler for example. So correct and tight boiler sizing to the load of the boiler and 10-1 is light years ahead of what we had. Space and cost are also deciding factors. Deciding on 2, 4 or 3 pipe buffer tank also depends on your system. If your shortest zone has 60' of fin-tube you're golden (that's 60' of actual fin-tube not 60ft of enclosure with 40' of actual fin-tube). 60' of fin-tube can emit 9,600BTU's with 110F AWT (Average Water Temperature). You could even supply lower water temp with 60' of fin-tube with a 8K BTU minimum turndown boiler. What type of radiators do you have, how many zones and what are the length of the emitters- if fin-tube (not the enclosure length) in each zone? Forgetting key part of equation. That's the btu loss of the room. Or zone. lowering SWT only gets you so far. With an 8k min TDR, there are many rooms/zones in which would have a hard time absorbing 8k above design conditions. Plan zoning loads accordingly with the minimum modulation of the mod/con. Also remember where you are at at design, and above design conditions on a zone. Not hard to plug in different OAT to a heat loss calculator to see what loads will be under various OAT conditions. Don't over zone, and or micro zone. Carefully combine loads to make a zone/zones which compliments the low end modulation of the boiler. Think about usage habits, solar / internal gain, compass orientation of exposures etc. As mentioned it's the distribution that drives the boiler operating conditions. It's not the knobs and settings on the boiler that regulate it's operating condition. Buffer tanks are another tool or component for hydronics, they are not always required to make the system behave. R 38 closed cell foam under attic eaves--unvented attic, just done this year. Basement zone: 27 ft of fintube baseboard in 80 ft zone run. Loss: 7700; Gain: 16,800? circ Grundfos 3-speed, lowest speed. Calc done by using Hydronics Institute IBR Guide H22. 1st and 2fl piped in series each floor rad to rad 3/4" copper except for old gravity risers 1.25". Boiler limit set to 160 max. Phase 1 of insulation in 2006 with cellulose in walls, outside styrofoam and vinyl, fireplace chimney top damper, etc. saved me about 30% in heating. 777 heating therms last year, t-stat at 65 day, 63 night. So total loss was 40k before spray foam this spring. But if I use Robert O'Brien's real-time heat loss method of annual btus times old boiler afue 75% divided by HDD, divided by 24 I get 486 btus per degree hour x 55 DeltaT from 65º setpoint to 10º design temp = 26.7kbtu. Realistic design here is really about 13º, but if I get conservative and say 75 degree set point, 0º design, I get 36,500btu. If I add the series piping, the cold brick added porch with insufficient radiation and insulation we'll want to heat someday, I'm back to 40kbtu. BUT THAT'S ALL BEFORE COUNTING MY 33% SPRAY FOAM SAVINGS. So it seems my whole house is a micro-zone. I don't kid myself that I'm tightly insulated--cellulose in walls is not an air-sealer--but relative to where I was with NO insulation, big difference. Phase 2 insulation, closed cell foam in attic is now saving me 33% off last year's useage. So if HDD are same this year I'd use 521 heating therms, saving almost $400 @$1.50/th. If a mod-con and indirect saves me 30% more off the 521 therms, that's 156 therms or only $234 a year off--and I have to spend big $$ to do it. Atmospheric 85% plus indirect's got to save me 15% and last many more years so mod con only saves me 15% more than CI. (Maybe more you'll say?) Of course I get less rebate with CI and chimney liner around here is a pretty big one-time hit. The reason for changing out now motivated by chimney inspection that recommended keeping an eye on a small crack or two, the boiler's super-short cycles now with the added insulation leading to condensing concern, our also-aging stand-alone hwh, etc. Our water in '06 tested 7.8ph, 103ppm hardness, 28ppm chloride, so some issues there. Will test again. While I so appreciate the art of hydronics installs--and mod cons in particular--I'm not sure that a small CI with a buffer tank is not the best solution. (Note that up here there isn't always a tremendous difference between mod con and ci install--a few thou maybe. I think contractors push mod-cons and raise prices on CIs to push people even more to the mod cons. The bottom line is really pretty simple here. If your system can absorb all the heat developed by the boiler, then the boiler can run (at whatever modulation that is) continuously. If the system cannot, then the boiler has to turn off sooner or later. The benefit of a buffer tank is that it provides another place to absorb heat from the boiler, and the bigger the tank the more heat it can absorb. The buffer is a last resort if after proper design short cycling is a foreseen possibility. With today's modulation tdr, and low end. Needs for buffering becomes less of an issue. It's great that you have CI rads- that goes a long way towards keeping a mod-con happy. Are the "gain" figures you're supplying based on 180F supply water temps? The 27 ft fintube baseboard zone will be problematic at condensing temps (130F SWT), can you combine it with another zone? @NY_Rob Thanks, no for the rads I figured 150btu per EDR. Oops now I think I'm mixing btu with temps....I lowered the standard figure from 170btu to 150, maybe that assumes 180 deg. Example: Living Room North US Radiator Triton 3 Column, 22”H, 9” wide, 20 sections @3sqft/sec = 60 EDR. I thought if I change out fin tube for cast iron baseboard or rads that might be easier; or maybe put in a really small circ that pumps really slow....not sure how slow that Grundfos 15-58 #1 position goes. Or Perhaps combine basement with the smaller zone 2, which would make two 20K zones albeit with varied gains. Maybe constant circulation, outdoor or indoor reset. It's all about water volume. I have designed many chiller systems. For comfort cooling you need a minimum water volume (regardless of the load) of 3 gallons of system water /ton of refrigeration. For process cooling (where you have more rapid load changes) 6 gallons of water / ton of refrigeration. True but once set point is met that's it. If you can design around less system volume that is superior. Why heat 40 gallons when you can do the same job with 10 with out short cycling. Oh quite. I agree completely -- but that "without short cycling" is often the joker, if zones are small. I figured 80ft length 3/4" L copper, for basement, 100ft Zone 1 mostly 3/4" copper, 120ft zone 2 (incl. 40ft 1.25" old steel risers. So about 10 gallons for piping, 5 in boiler and near piping= 15. PLUS CI radiators total 103 sections of US Radiator Triton rads 22"H x9" wide plus 54" total length of Governale rads 20"H, 5" wide. Seems like the rads volume would be huge, but when we've emptied zones for repairs never seems that much. So I'm not sure if this would be considered high or low volume water or if we should try to combine zones for greater mass or keep the 3 small zones if we can avoid short cycling. Cast rads should never be piped in series. The Dead Men from that time frame, usually did a very good job of matching radiator to heat loss. You may find that they are all over-radiated based on their size, but I'd bet they are proportionately over-radiated. At least they were, before someone piped them in series. Now you have the temperature drop from one radiator to the next.I'd consider pulling pex to home-run manifolds to fix that. Mod cons typically don't have very much mass in terms of water volume, even with radiant floor. Although the HTP UFT is almost a medium mass with 3-5 gallons of water if I remember correctly. Still about 1/2 of a cast iron boiler, even before the iron itself. not a lot. Compare that to a case iron system with thousands of lbs of iron and maybe another 5-8 gallons of water. Specific heat of iron is lower than water, but there's a lot of it. So even if you have no modulation, you might run the system for 20 minutes on a mild day and it heats fairly even for 3-4 hours afterwards having stored 33% of it's capacity in heated pipes and radiators. 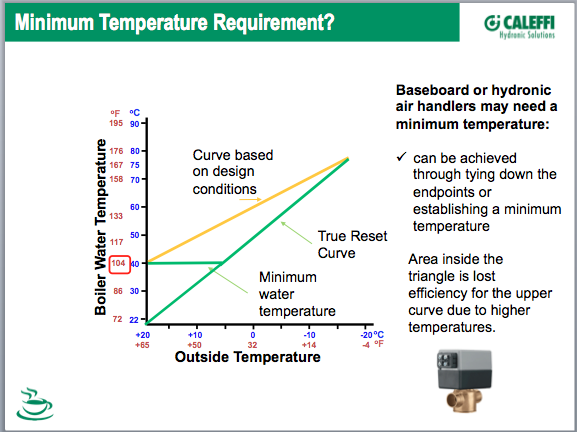 The goal in a mod con is low return water temp. Buffer tank reduces temp cycling and can create somewhat of a thermal gradient as well. Actually a mod/con, and a gravity rad system make for a nice marriage. As you say built in buffering. If envelope upgrades have been made the return water temps can be very rewarding. Reading all your thoughtful comments I can appreciate the years of study and hands on experience that gives you the kind of knowledge you have. Though I've learned a lot from this site and some books and articles, it's not always easy to follow along. It's one thing to take measurements for a heat loss, quite another to apply it in practice with hydraulics, chemistry, physics, etc. They can't say about hvac that 'it's not rocket science' because it is. Which is why it's so hard to find people really good at this. I may have found a local company that gets it, I'll know in a few days when I read their proposal. I'm not sure I've heard definitively on this thread a recommendation one way or another CI or modcon, though I think I'm hearing it could work with both. Many times you talk to 10 installers and get 10 different answers. There is often time more than one right way to "skin the cat"
All equipment, boilers, furnaces, ac compressors etc have a "comfort zone" or "operating parameters" whatever you want to call it. The trick is to design a system not oversized, not undersized that provides comfort, is efficient in fuel use that keeps the equipment operating within it's "comfort zone" and doesn't short cycle. Like Ed mentioned, an accomplished installer may have a dozen different way to pipe systems based on each individual application. Of course HO budget may prevent all installations from getting the most optimized system. Lower priced boilers may not have as powerful of a control. Features like adjustable ramp delay, post purge, anti cycling, etc are not on the price point boilers. My rule of thumb is if you have zones you need a tank. ....I'm not sure I've heard definitively on this thread a recommendation one way or another CI or modcon, though I think I'm hearing it could work with both. You're fortunate to have cast iron radiators which should provide plenty of radiation with and little to no cycling with a mod-con. So, you cleared the first hurdle. - Mod-Con can possibly save you 15-20% on your gas costs. - Mod-Cons generally require more annual maintenance then conventional atmospheric cast iron boilers. Research the particular mod-con you're interested in to discover it's annual maintenance requirements. They vary widely between models ranging from only a HX flush every 2 yrs to a HX teardown every couple of years. - In most cases, local service agencies do not carry spare parts for mod-cons. A blown mainboard/bad fan/etc.. may mean no heat or hot water for a couple of days. - Mod-cons will require a direct wall vent unless you want to install a $$$ chimney liner. - Must provide a condensate dry well or install a condensate neutralizer device (and clean/media refill the device 2x per year) and pump if draining mod-con condensate into existing plumbing. - Considerably more control over supply water temps (even down to each zone having it's own ODR curve on advanced mod-cons) vs. cast iron boiler. - More "even" heat from mod-con because of long burn times vs. pumping 180F water to the radiators for a few min then a long cooling off period till the next call for heat. - Sealed combustion is std on mod-cons. - Many mod-cons have advanced safety features for low water, low pressure, blocked flue, fan underspeed, high exhaust temps and even natural gas leakage detectors built right in to the boiler. - Possibly shorter life expectancy from a mod-con vs. cast iron boiler. We have people posting here with 50+yo cast iron boilers (that are still running well) all the time. Most expect mod-cons to last 10-20yrs (if installed and maintained properly). With all that in mind.... you also have to have a willing and able partner. If the local installers are reluctant to offer/install a mod-con- you'll be fighting an uphill battle that could have negative implications for years to come- especially when/if you need service. 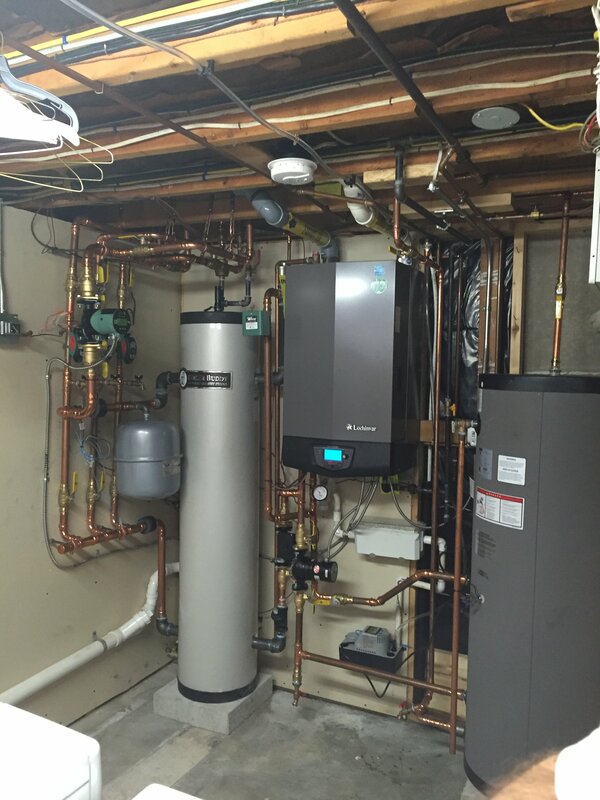 Upfront equipment, and install costs are much higher than that of a Ci boiler. ROI doesn't really shine until fuel costs are really high. That being said the overall goal is to reduce our carbon foot print to Mother Earth when ever possible. Some embrace their wallet more however. And the debate of mod-con versus CI can and will continue, probably for quite some time. When did mod cons first arrive?? I know it must be15 yrs or so by now. I think it’s worth noting. As you know the true conservationists are always onboard. The part timers only get excited when energy escalates, and the dent to the wallet exceeds the the ROI of that Mod/Con they were debating to get. You can either be prepared, or wait until you wish you were prepared. The mod con will be quieter and provide a more even, consistent heat. More comfort. 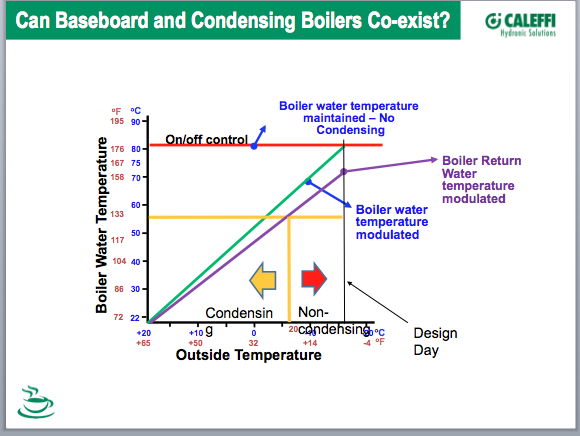 A properly set up CI boiler, and emitter system can achieve the same results. Depending on where the CI boiler is located it can be just as quiet, unless you dwell in the boiler room, or the boiler room dwells near you. 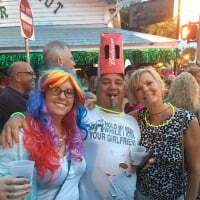 @NY_Rob Thanks for the great list of considerations. I see the US Boiler K2 comes in both firetube and watertube versions; another thing to consider. In my neck of the woods the price difference between mod cons and CI boilers is not so vast; the wallet is dented whatever you install. My concerns are about reliability, parts availability, finding competent installers who have the knowledge and skills that the modcon requires to a greater extent than the CI models. I hope to get a proposal in a few days. I think my Navien tankless water heat was louder than my 375k BTU HB Smith Cast iron beast. But the Lochinvar FTXL at my last job was super quiet... but ohhh open the hood on that baby and you had a dozen sensors, wiring harnesses and the ID fan staring at you. The cast aluminum Aerco boilers.... sigh... full rebuild every 3 years. The maintenance cost easily offset any gas savings. Especially since the idiot engineer had them pumping full speed so minimal delta T and 140+F water temp requirements. Complete waste other than the modulation. It occurred to me to ask if anyone thinks a 33 ft 7x11 internal chimney with a 4-5inch stainless steel liner would pose any problems for an 80mbh CI boiler? Probably wouldn't need to be insulated--though that probably wouldn't hurt--but is the height an issue? Stay away from aluminum HXers. Well just to report I asked the company for photos of their work, I was sent a few small ones but prohibited from posting them to any chat room or sending to a another pro for opinions. Deal breaker for me. Whatever limited knowledge I've accumulated I am in no position to judge an installation, and for me having experienced professionals' opinions is far more valuable than what a company says about itself or even references from former homeowner clients. Dump zones are for wood fired, or other style heating plants which can’t be precisely controlled. The buffer tank is from an era of 2,3,4,and 5:1 tdrs with 30k plus low end modulation as a band aid for short cycling. Coupled with small zoning appetites. We are moving into a new era of condensing equipment, and control advances. An intimate understanding of their controls, and emitter zoning designs to complement the new age condensing equipment designs needs to take precedence. I guess buffers still useful for CI setups. My mother's house, 2200 sq ft 47Kbtu Buderus G115/3 with old 50s convectors that don't retain heat after cycle. Boiler was smallest of the line but still oversized--yet half the size of the 50s boiler we grew up with. For myself, I realize this site both spoils and prepares you for the real world of contractors out there. I'm going to have to educate myself further on the hydraulics and system design so I can assure myself the contractor I hire really knows his stuff. There is a lot to be said for the large volume type boilers like HTP and Viessmann, on multi/ micro zoned systems. That puts the buffer in the appliance, hopefully well insulated. The 10- 1 certainly makes a huge difference, I've not seen many with below an 8K low side. So with micro zoned systems, in the majority of the heating season you will still get some cycling. Unless you calculate all the various zones, and look at weather data for your area to estimate % of heating season at what % of the load, it is somewhat of a guesstimate. @hot rod That third paragraph explanation is very helpful, about the required analysis. I just heard about the HTP Pioneer today. Love the idea of it being sort of a combo boiler-buffer. Issue is it's lowest turndown I think is 35k which is just about my design day. However would it be accurate to say that with the huge mass, the turndown becomes less of an issue? 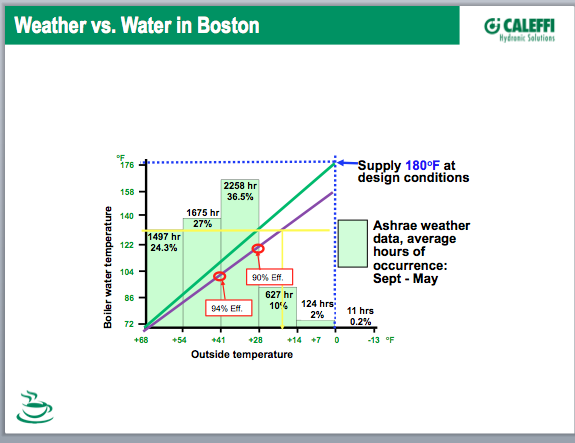 I've posted this before, it is an eye opening series of slides showing % of the year a location is at or below design. With the latest weather cycles I suspect more in the mid to higher heating season temperatures. Here we are mid December and we are still seeing 65 and warmer days in Missouri! 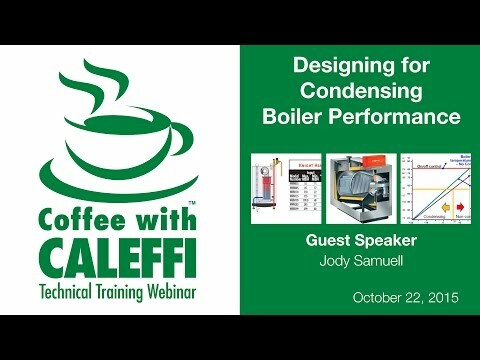 Jody our other trainer at Caleffi did a Caleffi, Oct 2015 Designing for Condensing Boiler Performance webinar on this topic, I believe these slides were developed by the Trethewey boys and Viessmann. Jody worked for that agency for awhile. The OP is fortunate to have cast iron rads which will help prevent short cycling because of their mass and the extended amount of time it takes to heat them to temp vs. fin-tube. Additionally cast iron also retains/gives off heat for quite a long time (vs. fin-tube) after the call for heat ends- so that will prevent excess regular cycling too. Win-win with cast iron rads + mod-con. Yes predicting winter weather patterns is a guesstimate these days. However one is still looking at a range of min. Max OAT temps in the season for your region. Plenty of data on weather websites to make good predictions.